Murder of C. Arthur Lyman, business man and civic leader, during the battle between police and striking truck drivers, in the Central Market, Minneapolis, Minnesota. This picture was snapped by an Acme photographer while Mr. Lyman (on ground in lower left) was being beaten to death. 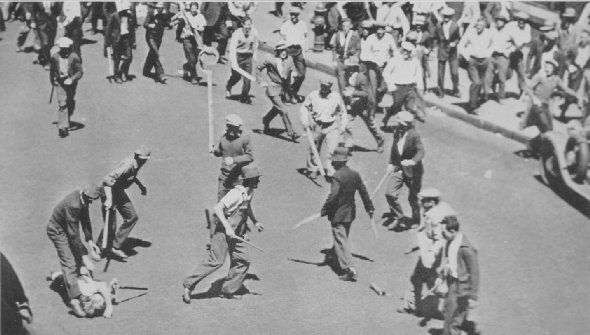 "The Communist League of America" is credited with agitating and leading this srike. The Proletarian Party of America, extreme revolutionists, whose center of activity is the state of Michigan. Workers' Ex-Service Men's League. The patriotic Ex-service men are so well organized that the communists are experiencing considerable difficulty in "boring from within" in these organizations. "There is a group classifying themselves under the head of veterans who have no license to even associate with the name of veterans. I refer to the alleged Worker's Ex-Service League. This group, I say without fear of contradiction, is actually representing the red Communist Part in this country and agitating former service men with their slimy and treacherous doctrines. "With unemployment and general depression prevalent in the country today, the reds are grasping a hold upon the country which should not be lost sight of. Conditions are absolutely perfect for this group to put over their contemptible underhand and cowardly blows aimed at the American form of government. This band of parasites who call themselves The Worker's Ex-Service League would much prefer sowing their seeds of discontent and preaching their slimy red doctrines than to undertake honest labor. They would not work if you gave them a good job. "Hundreds of thousands of real loyal and patriotic American Veterans under the stress of privation are tempted to listen at a time like this because mentally they are not themselves. They are susceptible to the reason of any person who talks sympathetically to their cause. The principals in this group while agitating for the payment of bonus at this time, I believe would not personally benefit by such legislation because I sincerely doubt if they have compensation certificates. They simply use the bonus issue as an excuse to gather together sympathetic and unwitting veteran audiences that they may present and promulgate their doctrines which strike at the very foundation of American liberty." It outlines simply the program, strength, strategy and perspectives of the Communist Party of the United States.... It indicates where America is heading and it makes a practical application of the lessons of the Russian Revolution to the situation in this country. *Reprinted by special permission of the publishers and copyright owners. The italics are ours.